Have you ever experienced the sudden instability in your knees while walking, running, or descending stairs? When it comes to your knees, do not dare to take a risk, for you will have to repay heavily for the same later. Fret not, Shree Meenakshi Orthopedics & Sports Medicine Clinic, the best orthopaedic hospital in India is here to get the best diagnostic results for you and also to seek out the right solution. 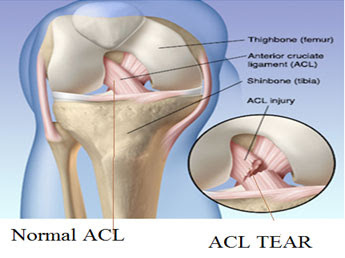 Anterior Cruciate Ligament (ACL) when gets tampered due to injuries demand a replacement called ACL replacement surgery. ACL reconstruction is done to fix the ligament at the centre of the knee. Are you searching for the best ACL repair surgey in India? Shree Meenakshi Orthopedics & Sports Medicine Clinic is here for your help. Once our doctors had finalized the symptoms for the tear and injury of ACL, the surgery is done as early as possible. ACL reconstruction is done with a prior general anesthesia. The tissue for the replacement is usually taken from the knee itself, which is known as an autograft. The surgery is done with the help of diagnostic arthroscopy. A scope with a camera attached to the end is inserted into the knee through a small incision so as to help the surgeon get a wider vision of the knee and to check the ligaments and surrounding muscles. Grafts from hamstring are the best choice for ACL reconstruction. Hamstring is the muscle that runs behind your thighs. Using hamstring grafts are helpful in reducing pain followed by the surgery, to have a faster recovery. The incision done for the graft is relatively small in the case of the hamstring. We, at Shree Meenakshi Orthopedics & Sports Medicine Clinic, take enough care to provide you with the best medical support you need during your weary times. We, are known as the best providers of ACL reconstruction surgery in Delhi, is here with the best solutions for your orthopaedic casualties and sports injuries.